This is one of those fabulous recipes that is so simple and easy to make, but tastes like you spent a long time on it. BONUS. It originally comes, I’m told, from Brennan’s in New Orleans; I found it here on Food.com. The sauce is rich and creamy without being complicated, and because I used chicken tenders rather than chicken breasts, this cooks up really quickly — perfect for a weeknight meal. I used more cream than the original recipe called for because I wanted enough sauce for the pasta too; I also added some olive oil, and some cayenne pepper for a little kick. Now here is my question: who is good at reheating cream sauce? Know any tricks? This is amazing the right out of the pan, but I have not yet learned how to reheat cream sauces without them separating and being weird. Who can school me? 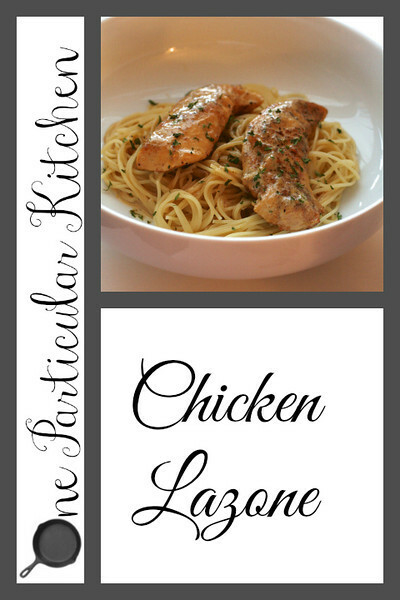 Never heard of Chicken Lazone, but all you have to say is “cream sauce” and I’m in! My trick for reheating cream sauce is to add more cream or milk and whisk whisk whisk! Good trick for reheating mac & cheese, too! Oooooh, yes. This dish looks awesome. I’m always looking for more ways to prepare chicken, and I love a spicy cream sauce. I’m with Leah on the reheating cream sauce. I think you just have to add more of the cream (or milk) and whisk it in. Y’all are speaking my language! Use your steam oven, it will re-heat ANYTHING as if it were just prepared! Even days old rolls!!!! To reheat cream sauce: place in microwave on level 3 until warm, then continue on level 5 on 30 second intervals. Never lost a sauce yet !